Enjoy the Hawaii Nature Center at Iao Valley State Park, Maui! The Hawaii Nature Center in Iao Valley State Park has something to appeal to just about everyone: a gift shop for the shopaholics and treasure seekers, a museum to entertain the kids, hikes through the rainforest for the explorers out there, and even a little cafe that's perfect for a quick bit to eat! 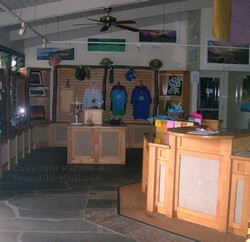 If you like to shop, you can browse in the Hawaii Nature Center's Gift Shop. It's a cool little gift shop with lots to see - and lots to buy! As you may know already, we're not hugely into shopping, but this little shop had so many cool Maui souvenirs, as well as educational material about the park, that we couldn't help but look around for treasures to bring home with us! The picture here doesn't really do the shop justice though I'm afraid. The first time we came here, I didn't get around to taking any pictures at all - I guess I was too busy shopping! On this last trip, we arrived on a Sunday and they were closed for the day. My only option was to take a picture through the front door window, so the quality isn't exactly awesome. Sorry about that! We had a bit of time to kill before our guided hike through Iao Valley State Park began, so we decided to explore the Interactive Nature Museum while we waited. Through more than 30 hands-on exhibits, the museum teaches visitors about the natural history of the islands here. If you have kids with you, I would definitely consider including the Interactive Nature Museum in your Iao Valley State Park itinerary. The museum definitely lives up to its "Interactive" name, and kids will likely enjoy checking out all of the exhibits. For example, what kid wouldn't like to see through the eyes of a dragonfly - in 100 directions at once? DECEMBER 2011 UPDATE: The museum is still closed for renovations... Last I checked, they don't know when it will re-open. So, if you hope to go here, give them a call next time you're in Maui for the latest info on whether or not they'll be up and running in time for your visit! Hungry? The Nature Cafe Has You Covered! We ended up here for lunch after our guided hike. We were desperately in need of some "fuel," and since we didn't notice any other restaurants in Iao Valley State Park, we were particularly glad to come across this place! As its name suggests, it's just a casual cafe... nothing fancy. But hey, nothing wrong with that! 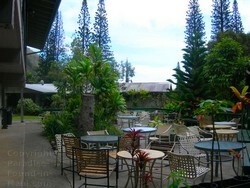 We ordered an inexpensive lunch from their take-out window, then made ourselves comfortable on their patio and enjoyed a little "picnic" before heading off to explore the botanical gardens at the end of Iao Valley Road. If you're driving from a South Maui locale such as Kihei or Wailea, head north on the Mokulele Highway (route 311). When you get to Kahului, it changes names to South Puunene Avenue. Follow this road to West Kaahumanu Avenue (route 32). Turn left onto route 32. Continue along route 32 as the name changes to Main Street, and then Iao Valley Road. 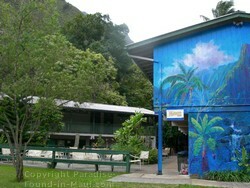 The Hawaii Nature Center is located at 875 Iao Valley Road. There is lots of free parking available. Get more ideas for fun things to do on Maui if you're in the mood for something easy and relaxing!